It's the one onion ring in your order of fries...How did it get there? What is it's purpose? It's the One Ring To Rule Them All! That's what! Ever get a little onion ring surprise in your box of fries? It actually happens a lot and you know there must be purpose behind the madness. It's the One Ring to Rule Them All! One Ring to Rule Them All is a hilarious throw-back to the "LOTR" movie series as well as a commentary on fast food etiquette. "I did not order an onion ring, what blasphemy is this?!" 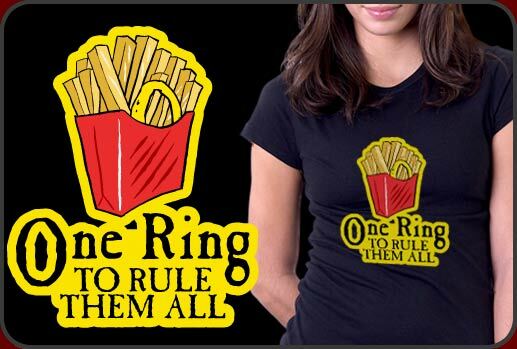 One Ring To Rule Them All is a very funny t-shirt with eye-popping colors and loads of tongue-in-cheek attitude. One Ring To Rule Them All prints beautifully on all colors and styles we offer.